This 8-year-old Westie rescue suffered from numerous health problems, including listlessness, recurring cysts, and itchy, greasy skin. These conditions were a result of inadequate nutrition, over vaccination, over medication, and having been bred too young and too often. In this report, Wendy Volhard describes her step by step approach to helping this dog regain her health. 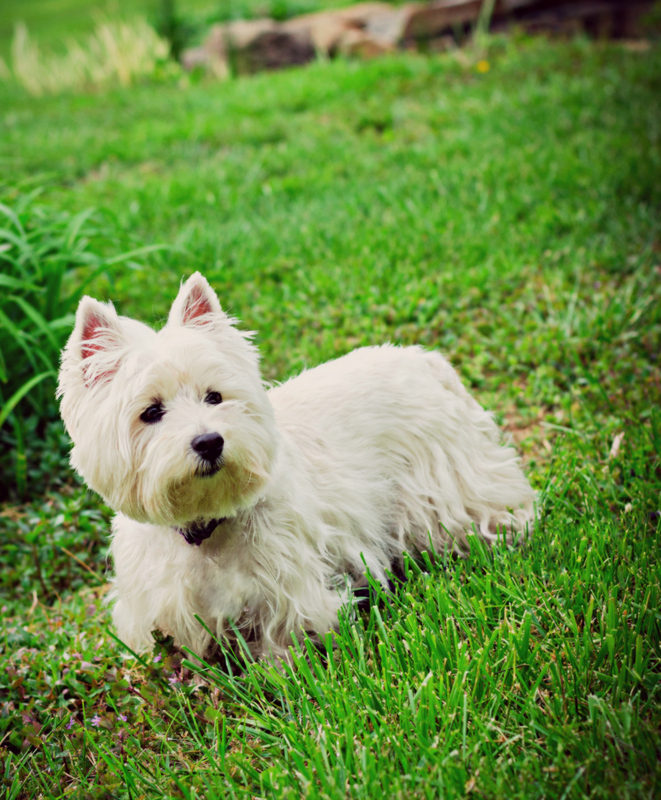 Maggie, an 8-year-old Westie, belonged to an obedience student of mine. 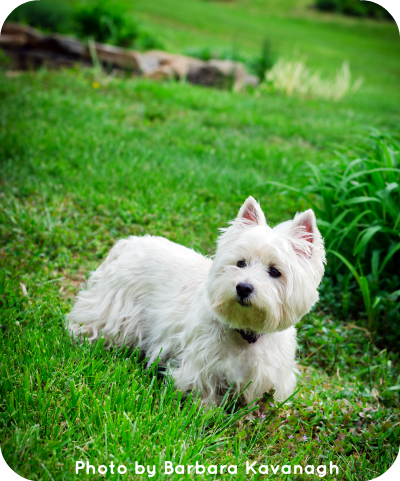 She always accompanied a younger Westie, Brody, who was training in the beginner’s class. I couldn’t help noticing Maggie – head down, tail down and shuffling along as she made her way to her crate to wait for Brody to finish class. One day I asked her owner Rita what was wrong with Maggie and if she needed help. The flood gates opened! 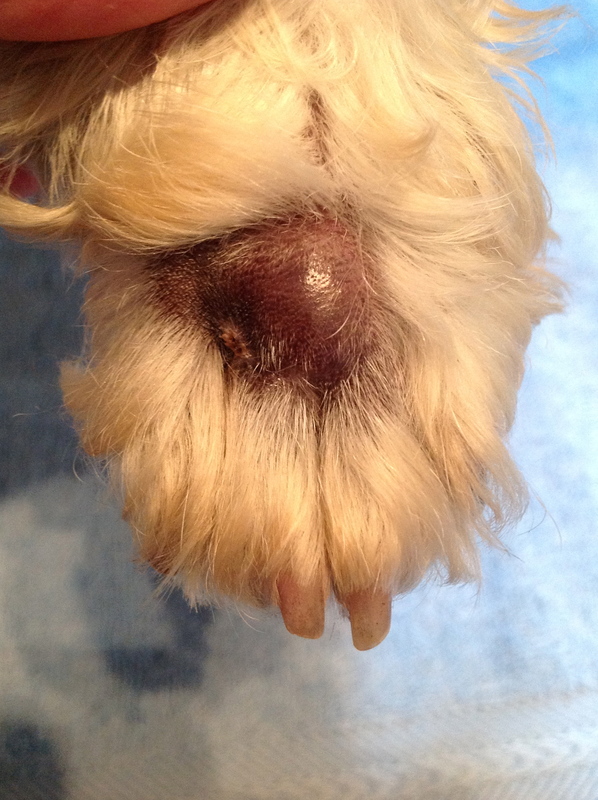 It appeared that every 10 days or so, Maggie developed an elevated temperature along with a nasty cyst on her right front paw which was so painful she couldn’t walk until it burst. The poor girl had only a few days between episodes when her foot was not painful. Rita had been to numerous vets and tried almost everything — continuous antibiotics, prednisone, and various creams and jellies. Surgery was suggested next. Nothing worked and Rita was desperate. My first and most important suggestion was a diet change from kibble to a natural whole diet. While this was scary for Rita, she was willing to try anything to give Maggie some relief. I suggested complete blood work (on a 12 hour fast). This included CBC, chemistry screen, urinalysis, complete thyroid panel, and panel for tick-borne diseases. Maggie was also checked for parasites. Results showed that Maggie was negative for parasites. Her cholesterol was high, sodium/potassium ratios not good, and all other values were on the high side of normal. Her thyroid was extremely low. Using kinesiology we did a diagnostic protocol (which goes through all the systems of the body) to determine Maggie’s ‘weak’ areas. This showed she had a structural imbalance and that her lymph system was stressed. We used the following treatment program for Maggie who weighed 17lbs. Homeopathic detox for her lymph system administered upon awakening for 5 consecutive days. A detoxifying diet was fed twice a day for 2 weeks only. This was a mixture of cooked chicken, a small amount of sweet brown rice, lightly cooked vegetables together with vitamins and minerals. I advised Rita to make up her food in bulk without the vitamins, put it into ice cube trays and freeze. Food was defrosted twice daily and supplements added before feeding. This worked well for such a small dog. Chiropractic consultation: During the initial 2 weeks, our chiropractic veterinarian worked with Maggie. She found that her neck needed adjustment and that she had a sore shoulder. The veterinarian chiropractor also gave Maggie an acupuncture treatment for her greasy skin. During her examination, she noted that some of Maggie’s teeth lacked enamel. Her thought was that this condition resulted from being bred too young, when Maggie herself was not mature. After consultation with our chiropractic veterinarian, a small dose of thyroid medication was given. Before bedtime one dose of homeopathic Thuja was administered to counteract vaccine damage. This was continued for 10 nights. After about 2 weeks, Maggie could walk without her head down and she was making eye contact on a regular basis. Rita was shown how to massage her neck daily. However, 20 days into her new program, her foot swelled again and she began to limp. Maggie was given the homeopathic Silicea 30c, to help push out any toxins in her body. The cyst immediately came to a head and burst and she could once again walk without pain. While Maggie was improving, Rita began to express concern about the cost. Up until now she had spent $2,716.29 at the regular veterinarian. The current treatment protocol (food, chiropractic adjustment, acupuncture and blood work) cost an additional $500. However, Rita became convinced we were on the right track when, after only 6 weeks on her new regime, repeat blood work demonstrated substantial improvement. This second set of blood work (again done on a 12 hour fast), showed that all of Maggie’s values were now within normal range. Laboratory values for liver and kidney function, as well as cholesterol levels were lower than before and her thyroid function tests were normal. Six months later more blood was drawn. All of Maggie’s laboratory results were perfect and she had not had a cyst for over 4 months. One year later, we did blood work yet again. Thyroid was still normal and she had had no cysts for 10 months. Hair had grown over the affected area of her back, but the skin remained somewhat greasy; this was managed with massage. Maggie continues to get chiropractic check-ups every couple of months, and she is lively and happy. It is essential when working on cases like this, to have blood drawn on a 12 hour fast and to use the same laboratory each time blood is drawn. Rita had wanted to try a new veterinarian closer to her home, and had blood drawn there a year after Maggie started her new regime. A different Laboratory was used, it was not done on a fast (once food is in the system, values can change), and the normal readings were not the same as the original Lab used. For comparative purposes, these results were useless. So, Rita took Maggie back to her original veterinarian for blood draws, which should be done annually. Excellent Wendy! It’s a wonderful inspiration to read about Maggie’s turn around through your sound analysis and application of these healing principles once again. Thank you!